Despite a long runtime, The 90th Academy Awards kept us interested the whole evening. Viewers were treated to a fun broadcast with many highlights. Roger Deakins, AKA the greatest cinematographer alive, has had 14 Oscar nominations and has never won once. Thankfully, that changed last night when he won for his best work yet, the masterpiece Blade Runner 2049. It is without a doubt one of the most beautifully shot films ever made, and, as I mentioned in my predictions piece, if Deakins hadn’t won, then the AMPAS probably would’ve lost all respect I had for them. Luckily, they gave him the Oscar, so there’s still a little bit of hope in the Academy. Having been a fan of Sam Rockwell for a long time now, I have been waiting for the day where he’d finally get his Oscar. I had hope after seeing him in Three Billboards Outside Ebbing, Missouri, in which he gives a phenomenaly layered performance (and one of his best performances) as a racist cop. It was very nice to finally see him get the acclaim that he’s deserved for a long time now. While Sally Hawkins gave the best performance of 2017 by any actor in any category, Frances McDormand was still phenomenal in Three Billboards Outside Ebbing, Missouri, and the best thing about winning was hearing her empowering acceptance speech. It was both amusing and inspiring, seeing her call on all the female nominees to stand up. People were watching A Wrinkle In Time in a cinema next to the Dolby Theatre (where the Oscars are held), and as a thank you to moviegoers, Jimmy Kimmel decided to round up multiple A-listers and surprise them with snacks. What a kind gesture. Imagine being surprised by Gal Gadot and catching a hotdog from Armie Hammer! Get Out was one of the biggest surprises of 2017, as well as a huge cultural phenomenon. The fact that it went from a small horror film, to sleeper hit, to potential Best Picture nominee, to literally winning Best Original Screenplay and getting multiple nominations is absolutely incredible. While Get Out may not have been my first choice to win, Jordan Peele still deserves it. I am happy that he won, and I look forward to his future work, as he shows a ton of promise as a filmmaker. As someone who absolutely loved The Shape of Water (it made my top 3 of 2017), I was incredibly happy to see it get as much love as it did, winning four Academy Awards including Best Picture and Best Director. This may very well be my favorite Best Picture winner in a very long time, and all of the acclaim that this film, Guillermo del Toro, and co. have gotten is well deserved. Laurie Metcalf gave an excellent performance in Lady Bird, portraying a mother who does not get along with her daughter 100%, but still loves her very much. Meanwhile, Allison Janney was too over the top for her character, and turned Tonya Harding’s mother into a comedic role. I honestly wish I could see what the voters saw in her. If we’ve learned anything from this year’s Oscars, it’s that you *can* have too much of a good thing. 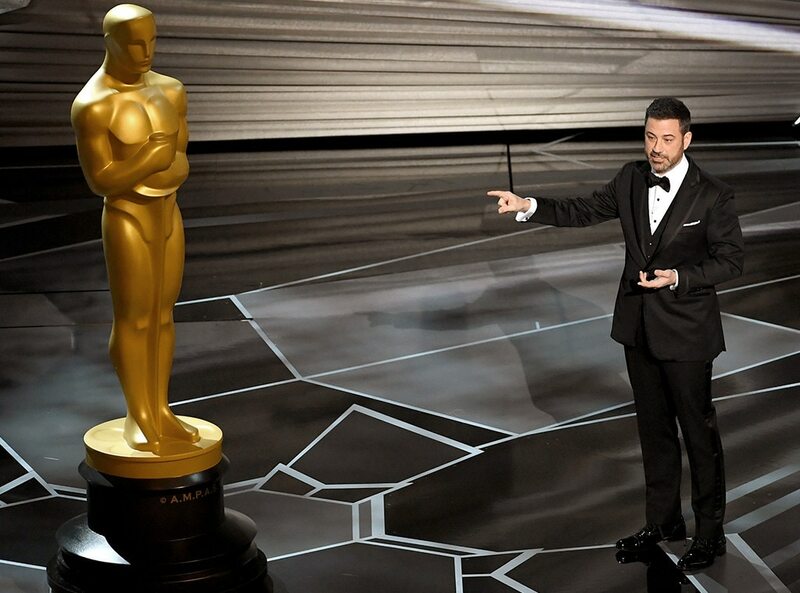 Kimmel was hilarious at last year’s show, but he just could not make it work this year. I didn’t laugh once during his time. I’m not kidding. The whole jet ski bit just fell flat. a study, not an opera. Zimmer was robbed. I wish the actor categories had changed even for entertainment value. directed and produced the show needs to be given a swift kick. they’re keeping the doctors busy. OMG. which I presume she borrowed from some Bedouin tribe. Even this year’s Vanity Fair Hollywood issue suffers from the PC disease.